December marks the beginning of snowy weather, hot cocoa, and seeing your relatives wayyyy too much, but for cinephiles it also marks the beginning of an onslaught of potentially great films every weekend. There are a few contenders for the best film of the year so far. Writer/director Kenneth Lonergan has thrown his new film, Manchester By the Sea, into the ring. 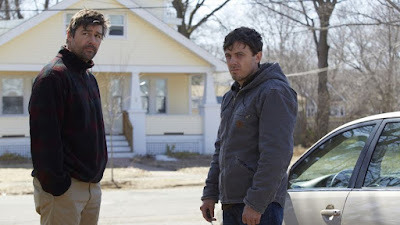 Casey Affleck gives the best male performance of the year as Lee, a Boston handyman who gets a phone call telling him that his older brother Joe (Kyle Chandler) has died of a heart attack. 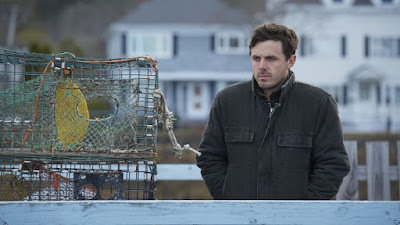 Lee returns home to Manchester, a fishing town in Massachusetts, to set up the funeral and figure out what to do with Joe's son, Patrick (Lucas Hedges), a teen who he used to be close with. In Lee's return to Manchester it becomes clear that something tragic happened to him here. People in the town murmur about him and look at him like he's a ghost. Lee keeps his head down and rarely speaks to anyone so he doesn't have to confront the past. Few other films, at least this century, so potently capture the feeling of grief like Lonergan and co. have managed to here. It doesn't go for the typical DRAMATIC EMOTIONAL SCENE to tell us about how consuming his grief is. The approach here cuts deeper. Lonergan goes beyond even everyday grief to focus on it’s grueling infection of the micro, e.g., Lee shoveling the sidewalk, fixing toilets, driving in traffic, finding a parked car, awkward small talk. The classical score by Lesley Barber gives these seemingly minor moments an operatic, graceful melancholy and speaks for the quiet Lee. All of this sneakily adds up to create an epic depiction of grief that's manifested itself into every crevice of this man's life. By the end I realized there was a giant lump in my throat. But this wasn't just because grief is the content of the film. Lonergan attempts to formally communicate Lee's grief. Often flashbacks are fleeting, and almost ghostly, but Lonergan's solipsistic flashbacks, which have the answer to Lee's mysterious tragedy, are livelier than the present. The quickest comparison, and most hyperbolic, for this type of flashback is The Godfather Part II. They're filled with characters, mini stories, and completely inform the present but when it cuts back you've almost forgotten about the present timeline because the flashbacks are so alive. Most of them feature Lee's wife Randi, played by the always magnificent Michelle Williams, and his brother Joe, the absurdly likeable Kyle Chandler. Lonergan has in a way reversed the usual form of flashbacks, and instead made the present feel ghostly and fleeting. In his 2011 masterpiece, Margaret, he let scenes breathe and diverge down avenues you wouldn't expect. This technique gave that film and now this film, a sense of lived in location and a rhythm where the characters could do anything at anytime. Playing with length/expectation of scenes melded with Lee's flashbacks forces the viewer to lean into the story. We don't just crave the information of the flashbacks; it's emotionally vital to experiencing Lee's story. Lonergan and DP Jody Lipes manufacture Manchester's endless crashing waves, falling snow, and merciless cold weather like an intervening landscape (similar to Certain Women). With Lee at the tumultuous center, the location becomes an emotional component mirroring Lee's locked away emotions. As tragic as its depiction of grief is, it's also a humorous film. Lee and Patrick's banter is hilarious. There's a ton of detours in dialogue where characters discuss stuff like Star Trek, boat motors, and the logistics of hanging out with girls. It's too organized and streamlined with familiar content to reach “M” word level praise, but it knocks on the door of potentially becoming a classic American drama with films like The Deer Hunter and Ordinary People, which similarly explore pain and grief to make the micro moments in life feel epic, universal, and worth pushing through, however unbearable it may seem. Currently out on limited release in the USA, out in the UK on the 13th of January.